The Trump administration may have to come up with new ideas to reinvigorate the enthusiasm for a southern border wall that was so much a part of his campaign and election last fall. Congressional skepticism about the project has been growing, even from some usually reliable southern and Republican delegations. Texas senior Senator John Cornyn (R-Tx), whose home state has the longest stretch of border common to Mexico, is wary of the economic impact a twenty percent border tax levied as a funding source for the construction would have on his state's economy. "The United States imports into our refineries a lot of heavy crude...Those would all be subject to the tax. One refiner told me that they believed that would increase the cost of gas by 30 cents...We have a unique relationship with Mexico, with maquiladoras (factories which have duty-free privileges) right across the border and in the car-manufacturing business in particular." Cornyn isn't alone in the Republican congress. True to conservative principles, others, including Lisa Murkowski (R-Ak), vow that a 10-12 billion dollar expenditure for a wall would need be offset with reductions in other parts of the budget, which would be difficult to find. As far as the demand that Mexico pay for the construction, Senator John McCain (R-Az), said curtly "No, that is not viable." The junior senator from Texas, Ted Cruz, however, has made no public comments on the proposal, possibly still fuming about recent Obama initiatives normalizing relations with Cuba. He really seems to hate Cuba, so is holding out support until Trump undoes Obama's work. Our sources have revealed a posssible contretemps that might have been an intentional leak of the administration's strategy to breath new life into the project. A bar service operator—call him "Moe"—related events at a recent evening in an out-of-the-way D.C. watering hole, in which he served White House dignitaries Kellyanne Clownway and Shaemus Spicer. After a couple of drinks the couple left, but not without leaving a scrap of paper, which, as it turned out, was an opened but empty envelope, and fairly covered with a scrawl of whirls, smiley faces, and what is now determined to be a literal back-of-the-envelope brainstorming session between the two about how to revive the national and White spirit for closing America that fueled support early in the campaign. "Good fences make good neighbors" was printed fastidiously at the top. Between the doodles and check marks, the envelope gave up the following: Plan A and Plan B. It was unmistakable. Despite the attempt to render the notes to hieroglyphical code, it was possibly a pseudo-cryptogram, intended to float a leak of possible strategies to reverse flagging interest in The Wall. After each bullet point was a short, abbreviated stream on consciousness. B. OP to guarantee loan--has extensive open lines of credit in Russia--has bundles of cash--trustworthy? (good for it?) --he's a builder, anyway--would he?--Got It! : Naming Rights! 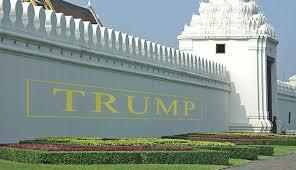 Trump Wall Texas—Trump Wall Arizona—Trump Wall....well, you get the idea. The chicken scratch near the end of Plan B., calling for the President himself to personally back the financing of the construction became less legible, as if the scribe, whether Clownway or Spicer, was losing confidence in B. and her cursive effort was weakening. And come to think of it, for good reasons: it wouldn't be like the OP would from $12 billion of his own cash, and getting a signature or collateralized loan for that sum would require proof of income, preferably in the form of a tax return. Not happening. The proposal seemed doomed. Trimming even a measly 1.6% from the nearly trillion dollar defense budget (the estimated amount when all the spin-off costs are accounted for) would meet with much resistance from the generalissimos, supply contractors, and weekend militiamenas as well, given WWIII threats being exchanged between North Korea's Kim and the OP; and as an impediment to the previously planned "Pivot to Asia" and nuclear arsenal modernization plans are already underway. There is no glossing over reality or utopian dreaming about world peace allowed when it comes to freedom, right? And maybe that was why the envelope was carelessly left behind: not as a plot to leak hare-brained trial balloons to bolster support for a bad idea, but just another dead-ended strategy session, a worthless crumple of paper, not worth a second look, like so many others lately that have been coming out with bad policy. But just in case, just saying, you heard it here first!